The largest city on the western coast of Sumatra, Padang enjoys a reputation as one of Indonesia's cleanest and greenest cities despite its hub of residential and commercial activity. You'll enjoy a bit of beach vacationing at Carolina Beach and Tiram Beach. Take a break from the city and head to Pasumpahan Island and Pantai Air Manis. There's much more to do - examine the collection at Museum Adityawarman, stop by Kripik Balado Shirley, tour the pleasant surroundings at Pantai Padang / TAPLAU ( TAPI LAUIK ), and head off the coast to Pamutusan Island. To get reviews, more things to do and other tourist information, you can read our Padang travel guide. Wrap up your sightseeing on the 18th (Mon) to allow time to travel to Bukittinggi. 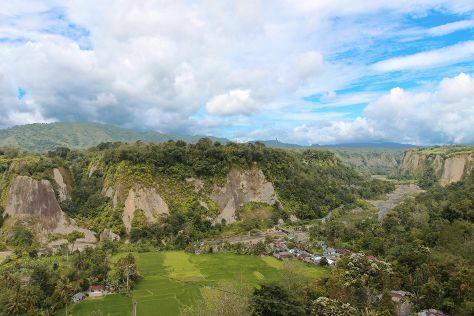 With a population of over 117,000 spread out over an area of 25 sq km (9.7 sq mi), Bukittinggi represents one of the largest cities in Western Sumatra. Get some cultural insight at Museum Rumah Kelahiran Bung Hatta and Goedang Ransum. Explore hidden gems such as Puncak Lawang Matur Agam and Jenjang Seribu. You'll find plenty of places to visit near Bukittinggi: Goedang Ransum (in Sawahlunto), Lake Singkarak (in Solok), Batang Palupuh Nature Conservation Center (Rafflesia Park) (in Palupuh) and Harau Canyon (in Payakumbuh). The adventure continues: get impressive views of Mount Marapi (Gunung Marapi), take in breathtaking views at Sianok canyon, and appreciate the history behind Jam Gadang Bukittinggi. To see more things to do, reviews, photos and other tourist information, you can read our Bukittinggi travel guide. Explore your travel options from Padang to Bukittinggi with the Route module.